This beautifully restored holiday home occupies a rather large estate. The estate consists of two residences, two swimming pools, and a large garden with several terraces. Both the home and garden provide outstanding views of the breathtaking surroundings. The house is very well finished and stylishly decorated. 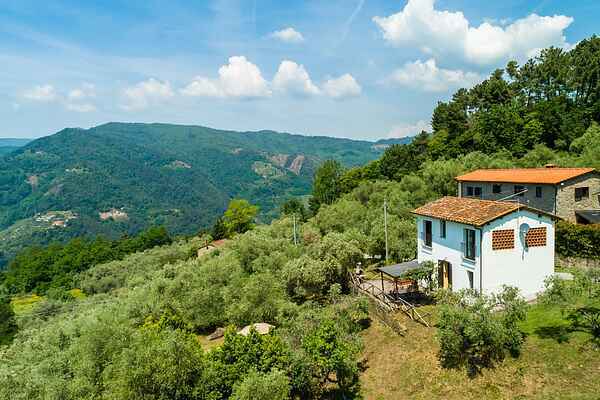 Set upon the green hills of Malocchio, the residence overlooks a beautiful valley. This small village is 5 kilometers from another small village called Percia. In these charming towns you can run all your daily errands, stop at the post office, or visit cozy restaurants. Just 10 kilometers away lies Montecatini Terme, where you'll find the most famous spa in Europe. People have been coming here since the 14th century for its healing waters. In addition to the spa, there is an impressive 18-hole golf course here. Pinocchio lovers can visit the Pinocchio Park, 10 kilometers away, in Collodi. The author of the story used the name of the town as a pseudonym. Day trips to the cities of Lucca (18 km), Pisa (40 km), and Florence (50 km) come highly recommended. For a fun beach trip, make a quick trek to Viareggio (45 km). The best shopping in the Pescia is without any question Esselunga. Be aware that they are closed on the Sundays .Look for the gas at small Gas Stations in the Pescia or Montecatini Terme,not on the highway.Closest place to eat at the reasonable price is Da Valentinos at the Malocchio.